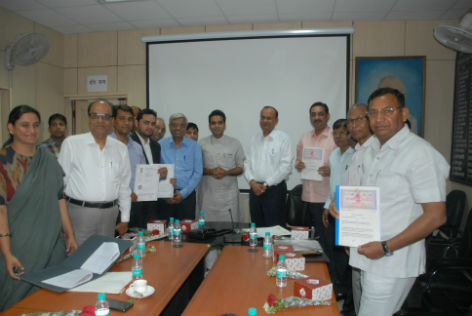 New Delhi: AKM Charitable Trust, the Corporate Social Responsibility arm of MBD Group—one of India’s leading education companies—today signed a memorandum of understanding (MoU) with District Administration of Gautam Budh Nagar to train and impart skill sets to around 1000 school teachers of over 100 schools in Bisrak district of Gautam Budh Nagar. As per the agreement in the MoU, the AKM Charitable Trust will, in close coordination with district administration, impart professional training in Educational studies and enhance “Experimental, socio-behavioural, psychological, and empirical knowledge” of teachers. The AKM Charitable Trust will also organise sensitisation training activities and capacity building programmes for school administrators and teachers. The Trust will also undertake the planning and ensure appropriate deployment of manpower and arrange sufficient logistics including training material like articles/case studies and evaluation, LCD projectors with screen, laptops/computers, audio/video accessories, whiteboards & markers, speakers and wireless microphones. The District Administration on their part will provide all necessary support in obtaining approvals and training venues. MBD Group also undertakes teacher training in India through MBD Disha, its initiative in collaboration with Imagine Education (UK). This programme is meant to equip teachers in content and pedagogical competence and their implications to classroom practices. MBD Group manages all its CSR initiatives through ‘MY BEST DEEDS’, which is managed by a dedicated Volunteer Committee and supported by the respective Corporate Social Responsibility champions across all verticals. The Group, through AKM Charitable Trust, extends support for projects like “Empowering Girl Child with Education”, “Swachh Bharat Abhiyaan” and many more social causes that help in making the community a better place to live in. AKM Charitable Trust regularly organises education campaigns for children and distributes stationery kits among them.